Being homebound or bedridden can diminish how we feel about our worth to God, but Elizabeth shares a scripture that may bring fresh hope. “For the Lord takes delight in His people; He crowns the humble with salvation. Let the saints rejoice in this honor and sing for joy in their beds. May the praise of God be in their mouths and a double edged sword in their hands” (Psalm 149:4-6). There are few positions quite as humble as being flat in bed. We feel needy, edgy, and impotent. It is so easy to think of the things we can’t do. Some of the simplest tasks become things we have to have others do for us or to us. Yes, the most humbling of tasks. When I came across today’s verse recently, I was reading it to my 97-year-old friend. Like those of us living with chronic pain and illness, her mind is relatively clear while the body shuts down bit by bit. It was with great joy that we could sit and ponder this truth. It gave a heady promotion to our lowly estate. All of a sudden, this pair of “old ladies” became vessels of honor, crowned with the joy of His salvation. We were made aware of the mighty weapon we held in our hearts. I held it in my hands, she held much of it in her mind. That morning, the two of us felt more important than the President, more honored than the most celebrated athlete. We were both still broke and feeble, but reminded that we had an impact far greater than any movie star ever did. Often we think of our status here is one of low degree, these verses us that we need not wait for Glory for our promotion. Lying in bed or resting in a recliner, we still have an honorable position. Our praise and godly conversation from our beds may seem like a lame offering to us. In God’s economy, however, it is elevated in value just as the widow’s mites. Let’s sing out His praises from our beds! Prayer: Dear Father, We praise Thee for hearing our hearts. As our bodies weaken our spirit soars with worship. You have given greater strength to our souls as our bodies decline. We are amazed at this holy paradox only You could accomplish. Because of such mercies, we can rejoice in our low degree. Thank You! Amen. Elizabeth Vendley lives in beautiful Lancaster, Pennsylvania. She has lived with pain since 1996 as a complication from surgery. Her challenges are from interstitial cystitis, dumping syndrome, and narrow angle glaucoma. Her seven children are grown and she has recently, miraculously returned to the work force as a direct care provider. She enjoys connecting with others in the Sunroom. 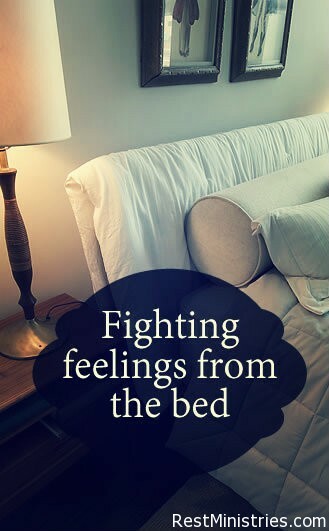 What feelings do you battle when you’re bedridden or home-bound? How does it change your perspective to know that you can still find joy and might for God? Filed Under: Devotionals, Finding Purpose, Loneliness, Suicidal Thoughts, What's New? Elizabeth – you bring encouraging words today! I never thought of the perspective I see now as I read this verse ( and then your thoughts ) that we could actually be wearing a crown placed on our heads by the Lord, while we are set apart in our weakened conditions ( no matter our age. I am homebound about 95% of the time. I do have to get out to get groceries and attempt getting to church but church going is very rare for there is a lot there that triggers my condition. Living alone brings its own “need” to push through for the necessities and I praise God that most of the time, I can. I have a dear friend who has titled me “couch ministries” and I remember one time reading this verse in the RSV where the word, “bed” is translated as “couch” and I had to laugh feeling it was okay to be on my couch so much. I was also recently reminded what a blessing our computers are. They connect us with the outside world when we cannot get “out into the world” and look at the friendships that many of us have made here on the RM site? Truly, God’s plans for us may not be all that we had hoped before chronic illness entered our lives but He is working his will out no matter where we recline. Thans for a great devotional! Thank you for a fresh, eye-opening look at this Scripture in Psalm. My disability keeps me in constant pain and unable to do many of the things I had once dreamed of doing; however, I have found much comfort in knowing that I am still able to read His Word and praise His mighty Name. The articles and devotionals from Rest Ministries really help me face each day, especially knowing there are others going through similar battles as myself and that I am not alone. Thank you for you devotional today, it is great to know that the way God sees us is not based on how we feel of the disability we may have. I really like your description of the “couch ministries” and I completely agree about what a blessing computers are. One of the things that I had the hardest time dealing with when I became disabled was having to stop being the youth leader at my church; however, I have discovered that even if I can’t do anything else, I can pray! So my ministry now is a prayer ministry that I can do from anywhere-bed, couch, recliner, etc. Thanks for your post, I really enjoyed reading it. I too have been encouraged by this writing. And the notes from both Lynn and James. I had to smile when I read the term, “couch ministries.” Such a great image to connect with. It has been a rough go lately, and the reminder that we are not worthless, as our conditions may make us feel at times, as we are yet Children of the King. How great is our God that no matter our condition, or surroundings he allows us and even yearns for us to communicate with him? Today, and everyday, I just need to remember to cherish that I am soaking in, savoring time in his loving arms. will encourage me when I have days I am bed-bound. I am housebound most of the time as well. It is VERY discouraging at times but I like to think of ways that I can minister right from my house. We can pick up the phone and call people, whether it’s other sick people or people who are shut-in or lonely. 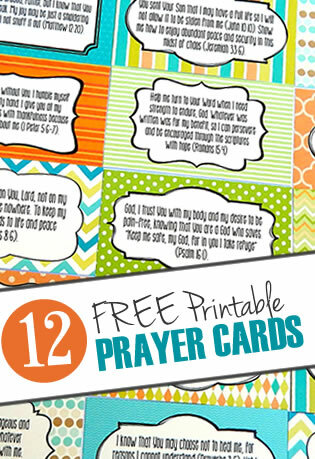 We can also always send cards to people and give them encouragement. Of course, we can write devotionals like these for other people to read. And most of all, we can focus on deepening our walk with Christ without so many distractions. By the way, my name is Elizabeth, but not the same Elizabeth that wrote this devotional. Just don’t want to confuse anyone! This sentence jumped out at me: “It gave a heady promotion to our lowly estate.” YES! It sure is only God that can give us this promotion & lift us from our humble situation. Love that! So many lovely gems to treasure in your devotional Elizabeth. Thanks for giving me new insights today, ones that are truly needed from my recliner. I recently had the opportunity to see Joni on the National Day of Prayer and she also mentioned this verse in her presentation. Much of her topic was on how a handful of broken people can have great impact through prayer. For some reason I feel as if the prayer from a sickbed for someone else’s welfare is an extra special payer to God.